Looking a possible playoff road trip square in the face, the Harvard men's hockey team returns to the tried and true against Clarkson at Bright Center tonight. 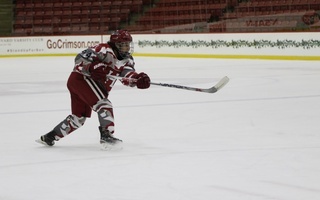 Once more, Peter Ciavaglia, Mike Vukonich and Ted Donato will skate as the Crimson's first line. Trying to rebound from a low-scoring loss to Vermont, Harvard will unleash the senior trio which, despite the Crimson's inconsistencies, still lead the ECAC scoring ladder. 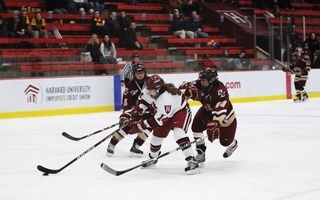 Now on the verge of hitting the road for post-season play's first round, the fifth-place Crimson (11-11-2, 11-7-2) needs a difficult combination of events, if Harvard hopes to continue playing at Bright next weekend. A victory over the Golden Knights, a win tomorrow against St. Lawrence and one Rensselaer loss--either to Colgate or Cornell--would together give Harvard home ice. Although this scenario--which would include two Vermont wins--leaves the Engineers, the Catamounts and the Crimson tied at 28 points, Harvard holds the tiebreaker edge over both squads and would nab the home-ice position. Clarkson and St. Lawrence beat Harvard the first weekend of January, and have not looked back yet. The Golden Knights (21-6-1 overall, 17-10-1 ECAC) have risen to tie Cornell at the top of the league, and the Saints (17-10-1, 14-5-1) are waiting in third place, only two points behind the leaders. Seventh-ranked Clarkson boasts the league's best goaltender in Chris Rogles, and the team has few fears about its offensive production. Last weekend, the Golden Knights destroyed Army and Princeton, 7-1 and 11-1, respectively. Tomorrow night's opponents, the Saints, also put a strong netminder between the twines. Les Kuntar (14-3-1 ECAC), who was slapped with a 10-minute misconduct penalty for aggressively clearing out the crease during St. Lawrence's 5-4 victory on January 4, hopes to play the whole game this time around. The Saints look to Mike Lappin--a Boston University transfer--and captain Andy Pritchard for offense. Pritchard, who tallied five times against Colgate February 1, is a Crimson-killer. The 5'10" senior scored two goals--including the game-winner--and assisted on two others. The 'back to the future' theme also visits the Harvard net. Junior Allain Roy will play in goal tonight, and classmate Chuckie Hughes will mind the net against the Saints.